In a hurry to play racing games the way they are meant to be? We can't blame you! That's why we have Ready to Race bundles, so you can buy a Playseat® chair together with the Logitech G920, with a discount of 10%! Don't wait any longer and order the bundle, so you can start racing like a pro. This bundle includes a Logitech G920 and a Playseat® gaming chair of your choice from our assortment. The time has come, the G920 from logitech is officially announced! Experience racing games the way they were meant to be with the newest Logitech racing wheel. Revel in the white-knuckle, hair-raising turns as you feel the tires lose traction and gleefully fly over every bump in the road. Custom dual-motor force feedback accurately simulates realistic racing action that will leave you breathless well past the checkered flag. 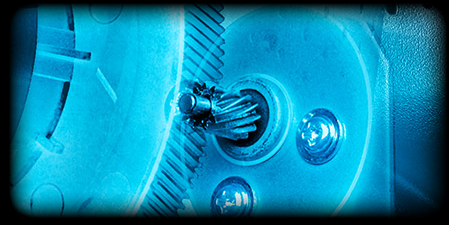 Thanks to smooth and quiet helical gears – similar to ones used in car transmissions – you can enjoy the power of force feedback without the road noise. Once you've tried the Logitech G920 driving force, you'll never want to use a regular controller again. The G920 game steering wheel is designed for the latest racing games for Microsoft's Xbox One. The Logitech G920 Driving Force is ofcourse also compatible with PC. Realistically simulates the racing experience with smooth, quiet helical gearing thanks to the powerfull dual-motor force feedback. Because of the simulated force effects you'll feel your wheels in every turn and type of terrain. With the Logitech G920 you'll also sense under- or over-steer drifting and more. Because of this you can respond with perfect precision. Take a grip and enjoy the sensation and comfort of a real leather racing wheel gliding beneath your hands as you speed around the track. Don’t worry about the stress placed on the wheel; it’s designed to take it. From solid steel ball bearings in the wheel shaft to quality construction throughout, G920 will provide superb performance and long-term reliability for every race. Compatible with 6-speed Logitech G920 shifter. 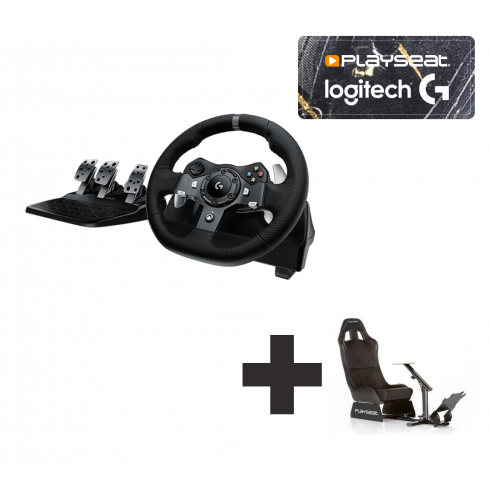 The Logitech G920 racing wheel is compatible with Xbox One and PC. For the ultimate racing experience, you should combine the Logitech G920 with a Playseat® racing simulator! Enjoy! The 920 is great, also have the shifter. Solid construction and heavy duty, I love racing and this is my first force feedback wheel. I absolutely love using this. The time has come, the G920 from logitech is officially announced! Experience racing games the way they were meant to be with the newest Logitech racing wheel. Revel in the white-knuckle, hair-raising turns as you feel the tires lose traction! The new Playseat® F1 Aston Martin Red Bull Racing is the race chair for the true Formula 1 Aston Martin Red Bull Racing fans! This is the racing simulator Max Verstappen - youngest Formula 1 driver and Grand Prix winner ever - uses at home! The number one racing seat for Red Bull Global Rally Cross fans: Playseat® Evolution Red Bull GRC! This is the officially licensed Red Bull GRC racing chair from Playseat®! It features the stylish and colorful Red Bull Global Rally Cross logos and imagery combined in one awesome design on the seating and the base of this racing chair. This is the PRO edition of the popular Playseat® Evolution Alcantara model! The design has been enhanced for an even more realistic look and feel! Take a seat and drive as fast as possible in the Playseat® Evolution Alcantara PRO! When you're racing with this Playseat® chair, it feels like your in a real racing car, thanks to the authentic shape and the high quality black Alcantara coating, which is an alternative to suede and used in real racing cars! This is the officially licensed Project CARS race chair from Playseat®! It features the well known, colorful Project CARS logos and imagery combined in one awesome design on the seating and the base of this racing chair. The stitched artwork is of very high quality and consists of unique color matched materials. The seat has a black frame and is coated with high quality black alcantara, which is used in real race cars! It can be used by adults and children, so all your friends and family members can enjoy this chair. This race seat is very comfortable, stable and highly adjustable. Thanks to its unique foldable design, it uses little space when not in use. This is the officially licensed DiRT racing chair from Playseat®, especially developped for DiRT fans! Experience how racing is meant to be with extreme realism and fun! Feel the evolution! Take a seat and drive as fast as possible in the Playseat® Evolution Alcantara! Playseat® chairs are used by professional drivers, who acknowledge the unique Playseat® quality and confirm that Playseat® chairs faithfully reproduce the position and the feeling of driving a real racing car! Feel the evolution! Take a seat and drive as fast as possible in the Playseat® Evolution White! Playseat® chairs are used by professional drivers, who acknowledge the unique Playseat® quality and confirm that Playseat® chairs faithfully reproduce the position and the feeling of driving a real racing car! Feel the evolution! Take a seat and drive as fast as possible in the Playseat® Evolution Black! Playseat® chairs are used by professional drivers, who acknowledge the unique Playseat® quality and confirm that Playseat® chairs faithfully reproduce the position and the feeling of driving a real racing car! This is the official licensed racing chair for all Forza fans, with the unique Playseat® quality! It doesn't get more realistic than racing in this very realistic gaming seat, which is modeled after the chairs in real racing cars. The Playseat® WRC takes you to a higher level of sim racing! This World Rally Championship edition is used by professional WRC racing drivers and has head stabilizers which are filled with high-density foam to protect your head during the most intense races. On the back and the sides you can find the WRC logo, so this truly is the best chair for all WRC fans out there! Challenge your opponents with the Playseat® Challenge! This seat is very compact, stable and adjustable. Thanks to its unique foldable design, it uses little space when not in use, so you can store it easily, for example in a wardrobe or beneath a bed. Ideal for people who have little space, but want a fun, realistic racing experience! The new Playseat® Formula E is the race chair for all Formula E fans! In cooperation with Formula E, Playseat® has developed this driving simulator, coated with the logo and decals of the popular class of auto racing. Experience the thrill of Formula 1 racing with the Playseat® F1 Red, the first ever official licensed Formula 1 racing simulator! The Playseat® Formula 1 models have been tested by professional drivers like Sebsatian Vettel and Max Verstappen! Experience the thrill of Formula 1 racing with the Playseat® F1 White, the first ever official licensed Formula 1 racing simulator! The Playseat® Formula 1 models have been tested by professional drivers like Sebsatian Vettel and Max Verstappen! Experience the thrill of Formula 1 racing with the Playseat® F1 Silver, the first ever official licensed Formula 1 racing simulator! The Playseat® Formula 1 models have been tested by professional drivers like Sebsatian Vettel and Max Verstappen! Experience the thrill of Formula 1 racing with the Playseat® F1 Black, the first ever official licensed Formula 1 racing simulator! The Playseat® Formula 1 models have been tested by professional drivers like Sebsatian Vettel and Max Verstappen! This is the black edition of our newest simulator series, the Playseat® Sensation Pro! With the Playseat® Sensation Pro - Black simulator you can take your racing to the highest possible level. The Playseat® Sensation Pro chair is fully adjustable for players of all sizes, you can easily control the incline of the seat, the distance to the pedals and steering wheel as well as the angle of the screen and much more! Go extreme with the Playseat® Sensation Pro race chair! This is the Forza Motorsport edition of the Playseat® Sensation series! Especially for all the real Forza fans, who want to play in an official licensed Forza Motorsport racing chair! With this simulator you can take your racing to the highest possible level. The Playseat® Sensation Pro driving seat is fully adjustable for players of all sizes, you can easily control the incline of the race seat, the distance to the pedals and steering wheel as well as the angle of the screen and much more! The game seat is made from the highest quality materials, with an amended seat back that allows the best racing. Built around a real racing position, to provide maximum resemblance with real life racing. Professional drivers acknowledge the unique quality of the Playseat® Sensation Pro and have confirmed that it faithfully reproduces the feeling of driving a real race car! Go extreme with the Playseat® Sensation Pro! This is the Pro edition of our newest simulator series, the Playseat® Sensation! With this simulator you can take your racing to the highest possible level. Feel the evolution! Take a seat and drive as fast as possible in the Playseat® Evolution DAKAR! Playseat® chairs are used by professional drivers like Tim and Tom Coronel, hence this Tim Coronel - DAKAR edition of the Playseat® Evolution! Whether you've got a fast job or just like to sit comfortable at your desk, Playseat® has the perfect office chair for you! This chair has been designed in cooperation with Top Gear, especially for all the fans of the immensely popular television series! Whether you've got a fast job or just like to sit comfortable at your desk, Playseat® has the perfect office chair for you! The Playseat® Office Chair - White has the look and feel of a real racing seat, but with the comfort that you need when sitting multiple hours at your desk. It's created with the unique Playseat® quality, using only high quality materials and a ergonomic design. Whether you've got a fast job or just like to sit comfortable at your desk, Playseat® has the perfect office chair for you! The Playseat® Office Chair - Alcantara has the look and feel of a real racing seat, but with the comfort that you need when sitting multiple hours at your desk. It's created with the unique Playseat® quality, using only high quality materials and a ergonomic design. Playseat® Office Chair - WTCC "Tom Coronel"
Whether you've got a fast job or just like to sit comfortable at your desk, Playseat® has the perfect office chair for you! The Playseat® Office Chair - WTCC "Tom Coronel" has the look and feel of a real racing seat, but with the comfort that you need when sitting multiple hours at your desk. It's created with the unique Playseat® quality, using only high quality materials and a ergonomic design. Playseat® Office Chair - DAKAR "Tim Coronel"
Meet the Coronels! Tim and Tom Coronel are famous Dutch racing twins who compete in the Dakar Rally and now you get the change to sit on their seats! Whether you've got a fast job or just like to sit comfortable at your desk, Playseat® has the perfect office chair for you! The Playseat® Office Chair - DAKAR "Tim Coronel" has the look and feel of a real racing seat, but with the comfort that you need when sitting multiple hours at your desk. Playseat® Office Chair - DAKAR "Tom Coronel"
Meet the Coronels! Tim and Tom Coronel are famous Dutch racing twins who compete in the Dakar Rally and now you get the change to sit on their seats! Whether you've got a fast job or just like to sit comfortable at your desk, Playseat® has the perfect office chair for you! The Playseat® Office Chair - DAKAR "Tom Coronel" has the look and feel of a real racing seat, but with the comfort that you need when sitting multiple hours at your desk. Whether you've got a fast job or just like to sit comfortable at your desk, Playseat® has the perfect office chair for you! The Playseat® Office Chair - Black has the look and feel of a real racing seat, but with the comfort that you need when sitting multiple hours at your desk. It's created with the unique Playseat® quality, using only high quality materials and a ergonomic design. Playseat® presents a revolution in race chairs: the Playseat® Revolution! Experience racing like never before in this comfortable, high quality race chair. The Revolution is fully adjustable and has a unique, patented foldable system for easy and fast storage. It has been developed in cooperation with professional racing drivers and is coated with high quality black leather look vinyl. With this chair you will leave your competitors far behind!